Tenacibaculum maritimum causes marine flexibacteriosis in many cultured fish species, including Atlantic salmon Salmo salar in Tasmania, Australia. 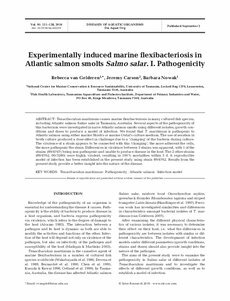 Several aspects of the pathogenicity of this bacterium were investigated in naive Atlantic salmon smolts using different isolates, growth conditions and doses to produce a model of infection. We found that T. maritimum is pathogenic to Atlantic salmon using either marine Shieh’s or marine Ordal’s culture medium. The use of aeration in broth culture produced a dose effect in challenge due to a ‘clumping’ of the bacteria during culture. The virulence of a strain appears to be connected with this ‘clumping’; the more adherent the cells, the more pathogenic the strain. Differences in virulence between 3 strains was apparent, with 1 of the strains (89/4747) being non-pathogenic and unable to produce disease in the host. The 2 other strains (89/4762, 00/3280) were highly virulent, resulting in 100% mortalities within 3 d. A reproducible model of infection has been established in the present study using strain 89/4762. Results from the present study provide a better insight into the nature of the disease.